CNN's GUT CHECK | for September 3, 2013 | 5 p.m.
CONGRESS TO KERRY: MAKE YOUR CASE… Democratic Sen. Barbara Boxer of California on whether the intelligence community agrees: Did they all come to the same conclusion, the various intelligence agencies? Kerry: To my knowledge, I have no knowledge of any agency that was a dissenter or anybody who had, you know, an alternative theory. MARKET WATCH: Tech mergers boost stocks, sending major U.S. indexes higher. Dow adds 23 points. NASDAQ gains 0.6%, S&P up 0.4%. President Wilson's League of Nation's tour started on this day in 1919. Where was his first stop? It isn't often that you get to write this sentence: President Barack Obama got a big boost today from House Speaker John Boehner. But that is exactly what happened today. "This is something that the United States as a country needs to do," Boehner said about military action in Syria after a meeting with the president at the White House. "I'm going to support the President's call for action. I believe that my colleagues should support this call for action." Boehner decision is big, but will it tip the balance? Leading Drudge: Boots Or No Boots? Leading The New York Times: Vote on Syria Sets Up Foreign Policy Clash Between 2 Wings of G.O.P. Flying to 112 countries is a lot until you consider swimming between 2. Feels like I swim with sharks – but you actually did it! Congrats! "Hillary" tweets about travel & swimming while POTUS talks war. Answers @PeterHambyCNN thesis ? about her team understanding social media. On this day in 1919, Wilson left Washington, D.C. for a 22 day, over 9,000 mile trip around the country aimed at advocating the upstart League of Nations. After signing the Paris Peace Conference in December 1918, Wilson returned to advocate for the League of Nations – an international body that Wilson said would help advert world war. When it became apparent that passage of the treaty would be difficult – if not impossible – Wilson decided to take his message to the people and deliver a number of speeches on why the United States should join the league of nations. His first speech happened on September 4 in Columbus, Ohio. In the next three weeks, Wilson delivered over 40 speeches in 29 cities, according to the Miller Center at the University of Virginia. The trip is widely credited with nearly killing Wilson. He collapsed in Colorado on September 25 and suffered a stroke on October 2 after returning from Washington. As for his effort – it proved futile. The Senate rejected the treaty 38 to 53. The turkey (?) from KY doesn't have an opinion. Just lustening to him turns my stomach. If we do this or don't do this what will happen. You moron. 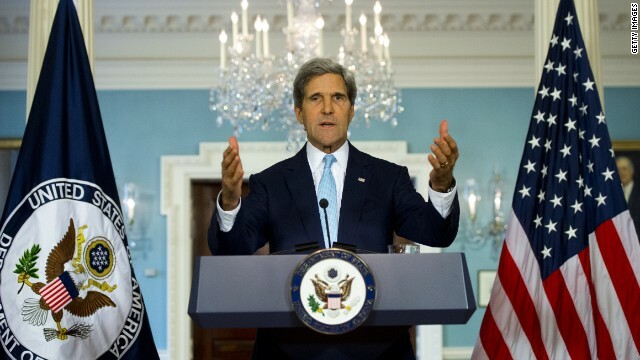 Kerry is putting him down as the idiot that he is. If this guy thinks grandstanding is going to make him look presidential he is sadly mistaken. He reminds me if a petulant tantrum child. Thank you Jerry for reminding US that this no civil rights for all fool us just that. First Hillary now Kerry. Please listen to the people on this one, and vote no on Syria. This administration lies on every single thing in the past 5 years. Don't get snookered again. what happening in Egypt, would this attack really help?. I think it will make things worse. Also there are terrorists working with the rebels. "President Barack Obama got a big boost today from House Speaker John Boehner"
No he didn't. Boehner can't control his caucus and hasn't said whether he will apply the Hastert Rule. No...what this is, is Boehner & Co. trying to set up a situation in which the vote goes negative and Obama gets no authorization...all while the Teatrolls drag it out, demagogue it and make the fallout even worse. Then, they'll essentially dare him to act unilaterally with his authority under the War Powers Act, responding to it by threatening or even trying to impeach him for it (one or two of them are already saying that they can impeach Obama if he enacts cruise missile strikes without congressional approval). It's all a joke and a game to them. The biggest things making America "look weak" at this point are the GOP/Teatrolls' displays of abject disrespect for our elected POTUS, their obstructionism that prevents any decisive action and their constant search for partisan political advantage and point-scoring via shenanigans like moving the goalposts or bait and switch legislative promises. What's with CCNs obsession with the leading story on Drudge? Kind of disrespectful to those who actually write news artcles for a living. What is an Aqua Buddha ? The debate about what will happen if.... The answer is who knows? We won't know till we get there. We can't know if boots will be on the ground till the responce from Syria is given. Marie is very tolerant. Our own died in Benghazi without support from the military. our own died. Now why the war cry. Want to help Islamic Terrorists again. Have we not learnt from, Tunisia, Libya & Egypt? More than 60% of Americans have stated clearly they do not want an attack! Not of any kind! but yet they are still going to. These are elected officials, they have jobs because we put them there. They are there to do our bidding, yet they do as they want not us. It is about time America speaks up stand up and tell them all They are fired! How does anyone think we can go and have limited strikes and just leave? It doesn't stop there it never does. My Question is who will be willing to come here and free us?